"Drop the reins. Trust me, JUST DO IT!" I addressed this command to a more advanced student mounted on a 17-hand Thoroughbred known around the barns for his sensitivity. It was the student's first ride on the gelding and she later admitted that, between the horse's reputation and his size, she was terrified. It showed. She held her breath. She held the reins in a death grip with tensed shoulders and rigid forearms. Grippy thighs, locked hip joints and her tight lower back made the horse uncomfortable. Searching for relief, he inverted his neck and back, started stargazing, and began to chase a bit. As he went above the bit and became less responsive to the rider's aids, her tension increased. The horse proved an excellent teacher. As soon as the rider released the reins and went to the buckle, the horse dropped his head to the ground, blew through his nostrils, stretched his back and began moving in a swingy, rhythmic stride. His generous response was a big lesson for this otherwise confident rider who was anticipating what 'might' happen instead of staying with what WAS happening and dealing with that. This incident is a classic example of how relaxation is both a physical and mental game. Relaxation is basic to everything we do with our horses either from the ground or in the saddle. Without it, things go poorly at best and very, very badly at worst. In a previous article on relaxation, I talked about how to build rider confidence so that a fearful rider's tension does not create tension in the horse. I also discussed how physical pain can affect a horse's ability to relax. I want to explore relaxation a bit more because it is such a complex topic. 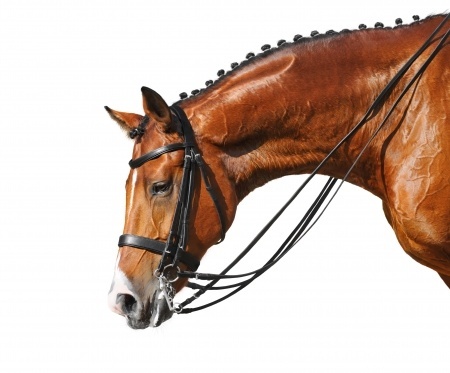 A rider's muscular tension may be rooted in emotional or physical causes. An anxious, fearful, frustrated, or angry rider will hold her breath, tense her muscles and lock her joints. Riders who lack fitness, balance, or sufficient flexibility in their joints to follow the horse's motion tense their muscles and joints to compensate. Either way, that tension transmits itself from the rider's body to the horse's body. There are some horses that will have the opposite reaction to a rider's muscle tension, though. They mirror a rider's tense, locked joints by locking their own joints until they are just shuffling along. Either way, the good news is that just as a tense rider makes a tense horse, a relaxed rider can make a relaxed horse. Whether a tense horse makes the rider tense or whether a tense rider makes the horse tense makes no difference. Either way, a feedback loop begins that will never lead to good results. Someone has to be the grownup. Goldie oldies take the 'grownup' role for beginning riders, staying relaxed through all of the mistakes an inexperienced rider makes. Most horses, however, are not goldie oldies. As riders progress and begin riding all types of horses, they become responsible for establishing and maintaining relaxation. 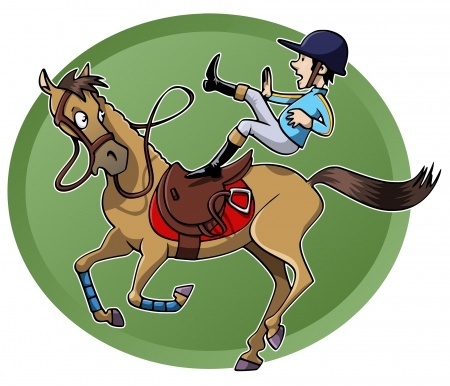 Riders often use tense muscles to make up for their lack of sufficient balance, fitness, or flexibility. It takes strong, flexible muscles (think of a professional dancer gliding across the stage) to support a rider without gripping or excess pressure. 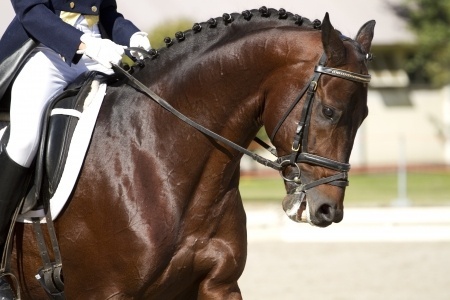 Riders with weak muscles and poor balance hang on the reins for support, lock their elbows, grip with their thighs, jam stiff ankles against the stirrups, lock their lower back and have difficulty staying balanced over the horse's center of gravity without wobbling in front or behind the vertical. A rider also needs good balance and an ability to follow the horse's motion at every gait in order to ride the horse with complete physical relaxation. Put all of these physical elements together and we say that the rider has an independent seat. It may seem like a contradiction to say that relaxation is at the base of our riding tree when we often need skills that are much higher up to master it. Rethink mastering riding skills as a spiral learning process rather than a simple linear one. The rider first masters a skill such as circling at the walk. Then she masters it at the trot, then the canter. At each stage she revisits something she already knows while adding something new. As a rider continually revisits and adds, she circles incrementally up the riding tree. So the basic relaxation level that a rider masters when first starting lessons will improve and increase as his or her balance improves. It becomes easier still to stay relaxed when he or she is able to follow the horse's motion at the walk, then the trot, then the canter. And when the rider achieves an independent seat, relaxation becomes easier to achieve and maintain under more circumstances that challenge her mentally as well as physically. Even advanced riders with a completely independent seat have anxious moments when a hot or spooky or otherwise highly reactive horse makes it difficult to stay relaxed and focused on the moment. It takes conscious effort for riders to keep their minds off 'what if' scenarios when riding green or sensitive or otherwise challenging horses. Focusing on the 'future possible scary' creates rider tension that just creates or feeds horse tension. Instead, riders must learn to focus on now and now and now and now. They must ride the horse stride by stride by stride without anticipating any future stride. As my mentor has always said, "ride every stride." Watching a confident, competent rider working with an emotionally challenging horse ride through a tough situation can be a revelation. The rider almost seems to be doing nothing. He or she is so focused on the horse that you can imagine they do not even see the boogey man running at their horse (or the mare in heat over by the rail, or the woman whose funky hat is flapping over by the in gate, or whatever it is that is raising the horse's excitement level). The rider just keeps on keeping on without changing the rhythm of the asking with the aids, quietly reminding the horse to return its attention to this stride, then the next and the next, all without tensing their own body or changing the rhythm of their breathing. When a rider finds herself tensing and gripping to keep her balance or unable to soften her lower back to follow the horse's canter, she needs to make a commitment to work on fitness, balance and body awareness on the ground as well as in the saddle. If she notices fears and 'what ifs' creeping into her mind and her muscles as she rides, she needs to mentally erase them from her brain blackboard and substitute a picture of that totally focused, totally relaxed rider we talked about. She needs to feel that picture in her own body. 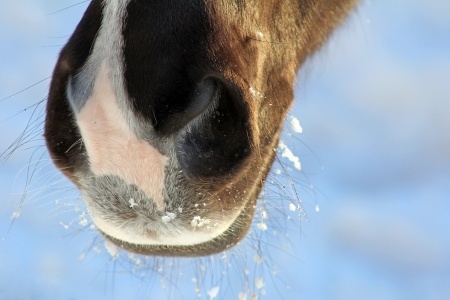 We know that horses will mirror any tension a rider holds in her body. We also need to trust they will mirror our relaxation just as easily.